My daughter just advised me there was a robbery up the street from her house LAST NIGHT! She NEVER RECEIVED ANY ALERT! She had no clue as to what was going on so close to her while she was outside with her 4 year old daughter walking her dog! She knew something was wrong because, She saw helicopters circling! I checked my “CodeRED” app and it said, MY SERVICE EXPIRED! I didn’t pay before , why do I need to pay .99 for a emergency Notification now?! Bottom line, this app should have never left the beta testing loop. The app has never worked correctly. It goes off from time to time alerting that there’s an emergency of some sort, but when you log into the app itself, you cant view what the emergency actually is. Not a lot of help to say the least. Beyond this, the app makers make money from local communities that distribute their emergency messages via the app, and then the app maker expects you the consumer to pay for the app to use it too! So you as a tax payer pay for it once, then you as a consumer pay for it again. No thanks. App will be deleted. Will be important with upcoming weather events. Alerts don't show up. The amount does but the information does not. This app would be great if it did what it was supposed to do. Too bad it’s completely unresponsive and useless. If you want an app to tell you where you are with a number of active alerts at the bottom that you CAN’T EVEN SEE then by all means. Otherwise, don’t waste your time. 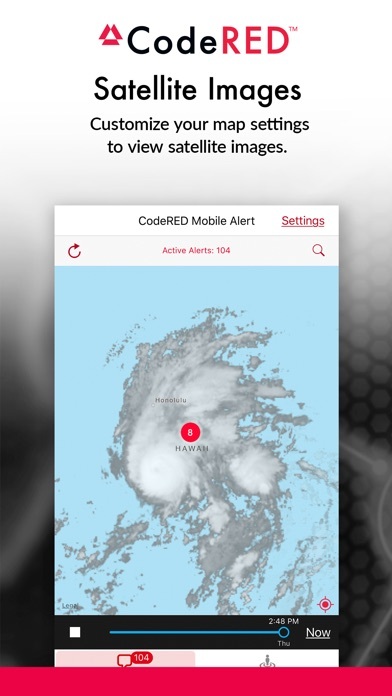 I rely on the CodeRED Mobile Alert App when I am traveling to receive important notifications. Recently I was in MA and received a Flood warning! Without this app, my safety could’ve been in danger while traveling on the road. Thank you CodeRED!! I travel A LOT for work. This app really helps give me information for where I am. This is a great app that provides me with general and emergency notifications no matter where I am located. Whether I am in my home town or if I am traveling for work I can receive important information. Highly recommend downloading this app so you are always in the know! I own an RV and this app allows me to see the incidents where ever we go clearly on a map. It has really been useful as we travel! CodeRED is excellent for getting vital information when I am at home or traveling. I didn’t have tv service while camping but this app let me know when my family needed to take cover during severe weather. Thanks for always keeping me informed about critical info. This app never worked for me. When I launched it today, it said that there were 45 alerts in my area, but I couldn’t read any of them, nor have I ever received any alerts from this app. Then I received a message that my weather subscription had expired & I needed to renew it. I don’t recall having paid for this to begin with. Deleted the app. I love how simple this app is to maneuver. I feel safe knowing I’ll receive notifications for my City while home and comfortable that I’ll be alerted while traveling for work. I’m glad my community is offering a service like this. 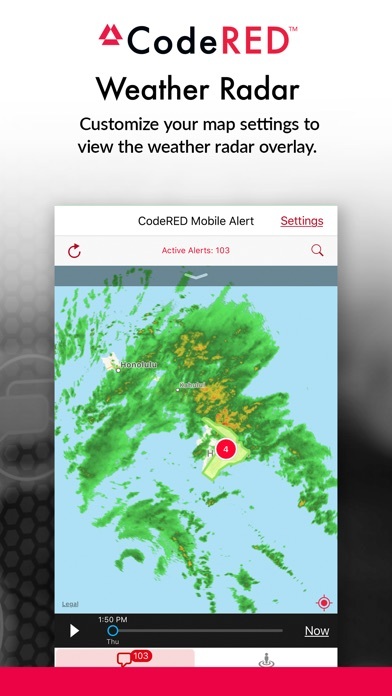 I check it regularly to make sure my family in other CodeRED areas are safe during severe weather or other events. I like that you can customize what types of alerts to receive and how far away the alert radius is. Keep up the good work! I downloaded this app and purchased two years of service because the city we live at has the CodeRed service and advises us to download this app. BUT then by accident I logged off of it and I have not been able to retrieve my password. The App says that it has ‘sent’ an email for me to reset but the email has never arrived. So, here I am in KS, in the middle of tornado season and unable to use this app. Plus, while I was able to use it (last year), I never received a sound/alarm notification even though I had set up for the most noisy alarm available and for a close range to my location. But it never informed me of impending bad weather, I had to manually look at the app to review the weather. I really enjoy this app. We had a severe weather event that was identified by the app. Five minutes later we had hail, rain and lightening. We were able to get the car in the garage with a couple minutes to spare. Not only do we get the push notification, we get SMS and a phone call. Thank you OnSolve!!! Did someone get paid to develop this app? Try looking up any of the fires all over the news right now. This is irresponsible, they need to take it down and stop adding confusion to dangerous situations. After reading the developer responses - I don’t understand, are you going to troubleshoot interface problems with people after they’re burnt alive in their sleep, expecting an emergency notice from you that didn’t work properly? I have received no alerts when there have been fires. And when I scroll on the map to see other fires that are burning, it shows nothing. It’s dangerous to have an app like this out there. People expect to get a warning, and get nothing. Warning: if you sign up online with a third party oauth service (facebook/google) you can’t login with this app. ...And I can access it on a computer or usual search bar just fine. I am set up for emergency alerts for my area but the past two times I tired logging onto my account it said my username or password was wrong so I changed my password and it still says so. So I logged in on my computer and I logged in just fine. So idk why I’m having this issue with the app. What’s the point of any app that is confusing/doesn’t work? It seems to be completely non-functional. I have NEVER gotten an alert. We have had two major crimes in our area today. One was a fatal shoot that was huge on local news that happened less than 2 miles from our home and nothing. The other crime made national news and again nothing from the app. Completely worthless! 1) cannot pinpoint emergency site on map (we are in rural area) 2) sound does not work for either notifications or for verbal option in determining nature of alert. Please add the option to have one or more zip codes for locations, rather than requiring gps only. As other reviewer has also stated, having to navigate entire US every time App is loaded is not efficient in an emergency. I can see you building a good beta version upon these suggestions - a good start. This app is worse than nothing, as it fails to show what should be alerts within my set radius. I signed up on the website using my google account information (Log in with Google). I can’t sign in to the app. The app is pretty useless. Trying to download the app and we keep getting errors. The message reads "if problem persists, contact customer service". Crap app that defeats the purpose of trying to se in an actual storm! I’ve tried over and over to renew subscription with no luck. Yesterday I got notified I bought it twice when I had not done anything. 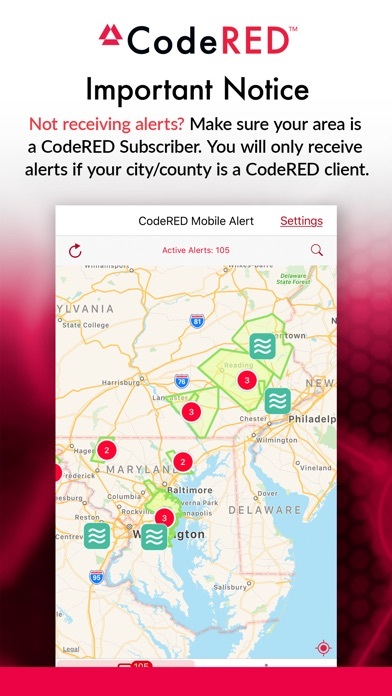 I Love Code Red, I would like to know how to benefit from it when traveling out of state any emergencies that may come up at home or out of state in the area I might be in. Also, I know someone who lives in Royce City, Texas I know that this was sent to us in our Utility Bill for the Residents in Garland, Texas to sign up but, is this for anyone to sign up for? Website logs in, but app fails to log in with same credentials. This has been an ongoing problem in addition to accounts just being randomly deleted. Good idea, bad execution. This app does not allow me to log in with my correct username and password at all!! Beta release at best - Separate login? Really? How do you decide to launch an app that requires you to create a separate login from the website it's toed to? I've never even heard of such a thing before. I know that they're "working on it" for a future release. But how is logging in to the app with the same login as the website not feature #1 in a mobile app companion to a website? Truly baffling decision. I downloaded the Code Red app to my iPhone and followed the directions but I was not able to register due to an error message that says “something happened during your registration and the registration failed.” I will delete the app from my phone if I cannot get my registration to work. Thank you. I thought this app would be a good addition, but as soon as I installed it I began getting SPAM email to the email account that the program sets up for your “alerts.” Not what I signed up for. Into the trash it goes. If you've signed up on their site and used Google, Twitter, or Facebook to log in you can't login into this app. It also glaringly omits the ability to use password managers if you wanted to register an account directly with them. If you've failed to get right the first thing your customer interacts with, I can't help but wonder what else might be wrong with it. Doesn’t work. Left me high and dry during Irma. I was having issues with this app not alerting me to anything during hurricane Irma. I reported it was not working. Was told to remove the app and download it again. I did that. It now will not let me sign in to it and will not let me register again. Keeps saying error please try agin. Why?!?! Don’t receive any notifications and alerts won’t open. Such a huge disappointment. Needs updated but dev won't do it. It helps me know if there is something happening, if there is a fog delay at schools, snow delays, ice delays. EVERYTHING! Totally recommend! No info in my area! I’ve set the alert area to 13 miles around me. When I check it, it shows exactly where I am (FL!!! ), but I only see the alerts from North of Tennessee! Really?!?! That does not make any sense! Useless! We just had the most destructive fire in California’s history! Not sure why other reviews were bad. We’re in Northern California and this was extremely helpful during the fires. Thank you for the app! This is a hideous app design to subject people in emergency situations to. It appears to be easy to miss important information. When I adjust the map it shows 19 or 20 warnings for my area… But I can’t see any of those warnings. The net is that it alarms me and then won’t let me see the information. If I do bring up one warning, it will only let me show one, Is not an entire list. There’s no way to navigate the list on the cell phone. The backend directions of this may be better for the emergency management folks, but it’s really horrible for the people they need to get the notices to. UPDATED: Re the developer’s response: I get the concept you’re working from but strongly suggest you get some different UX folks to do a review of this for feedback to your UX team. I would also strongly advise that you put your blind testers under some sort of strong pressure while testing to see how well they comprehend your interface under those conditions. Under those conditions it becomes completely opaque. Please, please, please take the feedback on this app to heart and make some adjustments and tweaks to it. You’ve got a valuable start but I fear someone’s going to miss lifesaving information (as I might have) if you don’t work it through some more. I had to go to other less-opaque sources of information during the Northern California wildfires to understand what the situation was. UPDATED REVIEW: I wrote the review below back in June 2017 and uninstalled the app. At my father's request I installed it again. You see, my dad is a disaster and emergency services coordinator and a customer of CodeRED, he's one who sets up these alerts albeit for a different state than where I reside. It hasn't been 24 hours and already I'm going to uninstall because the officials in my state are still too dumb to realize that marking everything as "emergency" makes the service an annoyance and not helpful. 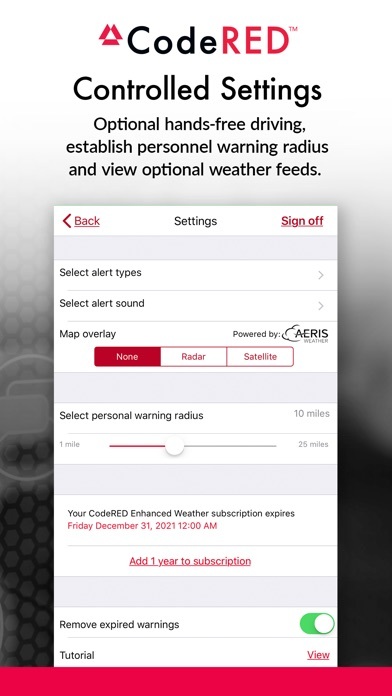 Until CodeRED works on actively educating their customers on how to make the alerts useful rather than annoying there is no point in having this installed. You will get more accurate, useful information, sadly, by just looking outside. ORIGINAL REVIEW: Seems like a nice idea but the problem is that every agency marks everything they want to alert to as an "emergency." So when you have missing person alerts disabled you'll still get the full blown emergency alert for some one reported missing on the other side of the state. There are multiple options those issuing the alert can choose, making everything highest priority makes the app useless. Trustworthy and quick. I really have a peace of mind with this downloaded on my phone. The other reviews on here are because people aren't reading the directions. 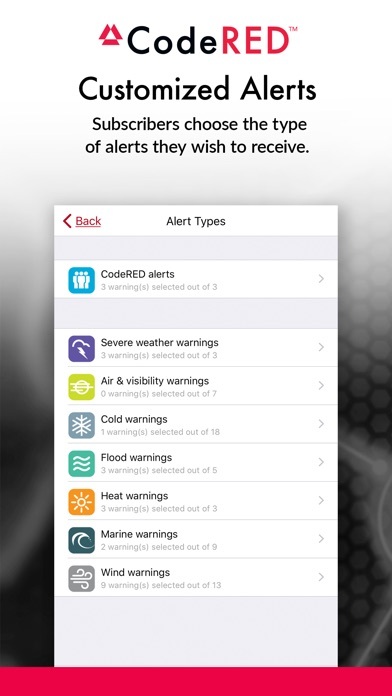 Total alerts means country wide alerts, not your area. And this is a separate login than the desktop version. Easy to use if you read directions ! Update: While I appreciate the developer reaching out seems like a bad design/partnership with officials to have people need to create two accounts. I also got the same alert today 15+ times.... seems odd. Still can’t give it 5 starts yet.... Original: Login works on website and my local county website but not on the app...what gives.... and there are literally dozens of fires in my town and my local gov said to use this because they are “pushing all alerts there” and your app no nothing in that area literally no issues at all. There is a huge fire across from me, but looking at this app you would never know it. It says there are 26 alerts in my area, but apparently the app is going to keep them secret. I found out about this app because the agencies in my area do subscribe and told me to download this app. I don’t know whose fault it is that isn’t working and I don’t really care. I see 13 alerts but cannot figure out how to read them. Poor design and functionality. The app. won’t let me create an account!!! !